Al Norman, who has been called the "guru of the anti-Wal-Mart movement" by 60 Minutes, has written a book calling for a national consumer boycott of the giant retailer. The timing couldn't be better. Wal-Mart is drawing more heat than ever in its history. It has become perhaps the most disliked retailer in America today. The Case Against Wal-Mart is presented as a legal brief against Wal-Mart – with "counts" against the company ranging from its employment practices to its "Made in America" mythology. Demands millions of dollars in tax breaks to locate in communities all over the U.S., while it earns billions of dollars in profits. Written by Al Norman, the world’s foremost expert on and leader of the anti-sprawl movement, The Case Against Wal-Mart calls on consumers to go on a "Wal-Mart diet." Norman says that only a consumer boycott of Wal-Mart will show the company that U.S. citizens disapprove of its business tactics. This is a book every American shopper should read before making another trip to Wal-Mart. As Al Norman says, "Friends don't let friends shop at Wal-Mart." ​A grassroots activist who has helped countless groups organize efforts to fight the spread of Wal-Marts in their hometowns, Al Norman has been on 60 Minutes and quoted in publications from Fortune to the Wall Street Journal to the New York Times. He posts frequently on his blog, Sprawl-Busters.com, and continues to contribute essays to the Huffington Post. "​His style is that of a fire-breathing evangelist." 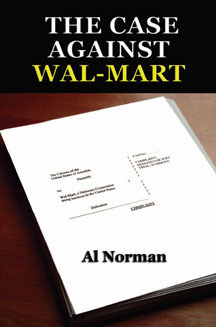 "In The Case Against Wal-Mart, Al Norman delivers a blistering indictment of Wal-Mart's meteoric growth and practices. Even if you think you've heard all the dirt on Wal-Mart, you will be shocked by the voluminous detail Al Norman provides on the inside workings of the company and the closed-door maneuvering of corrupt City Council officials that welcome them in with streets paved with cash."